Just went to zukis website but they are still not showing the different color c90's. I think the price is a little high and most jap dealerships don't come off MSRP by much. I don't know why Suzuki didn't redesign these bikes since it is their 50th anniversary and all. I guess a slow economy and slow bike sells is the biggest reason but painting chrome parts black is not really what you can call a new bike. I went to the local dealer site and the showroom had all the new models listed. I went across town to see them and they had none on the floor and 2 new 109's in crates. They're remodeling the interior and then will get the new models in. I don't mind the black, but it should have been the M models, not the C's. Qualcuno di voi l'ha acquistata alla fine ? io ne sono possessore dal marzo 2017, era in concessionario che non era riuscita a venderla, appena arrivata in garage ci ho lavorato su 17 ore e con 3000, ho apportato le mie modifiche para-motore, aggiunta di altri 2 fari H4, con circuito parallelo e tasto per lo spegnimento del faro principale per non sovracaricare la batteria, schienalino e porta-pacchi e luci sotto motore e di sagoma per quando vado in strade poco illuminate. sono un ex possessore di una intruder VL800, le differenze ci sono la C1500T pesa circa 50 kg in più ed è leggermente alta, di fatto è difficile spingerla a piedi all'indietro perchè i piedi non poggiano del tutto e sono alto 1,75, i consumi non sono così pessimi fa 20km/l in autostrada e 15-17 km/l in strada urbana. rispetto alla VL800 in movimento è molto più manegevole, il doppio disco anteriore assente si fa sentire nelle frenate, però il fatto che sia ad ignezione fa si che non si aspetti che si scaldi il motore e si può partire immediatamente, mentre la VL800 si doveva aspettare che si scaldasse, dato che era a carburatore , altrimenti vi era il pericolo che la moto si spegnesse e mi disarcionasse (già capitato diverse volte). L'unica mia domanda pè se qualcuno di voi alla fine l'ha acquistata e se ha forato i finali delle marmitte per avere un sound più corposo, io ancora non ho deciso, ma così è troppo silenziosa. So che i post risalgono al 2012, ma spero che qualcuno possa aiutarmi in questa decisione, un mio amico mi disse anche se ha la sonda lambda e fori solo il finale non succede nulla, ho ancora qualche dubbio. English translation courtesy of Google. Looks like it did a pretty good job. Did any of you buy it at the end? 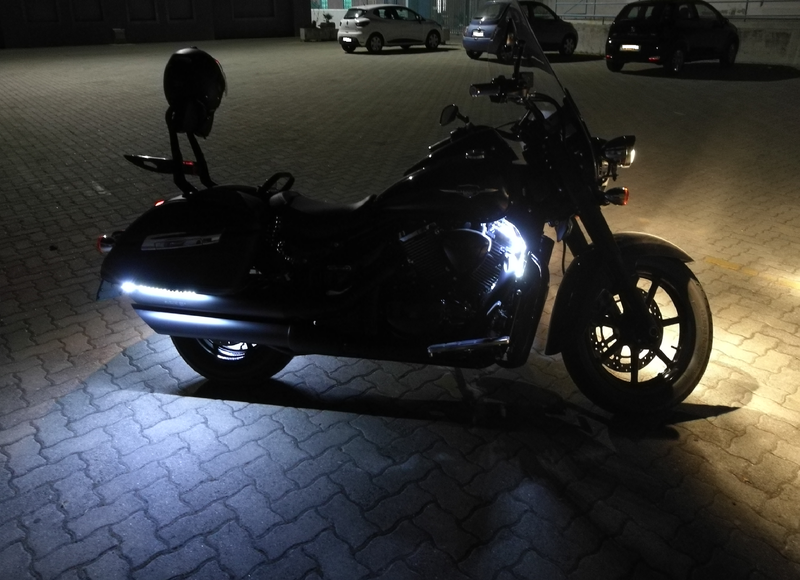 I've owned it since March 2017, it was in a dealer who could not sell it, as soon as I arrived in the garage I worked on 17 hours and with 3000, I made my para-engine modifications, adding 2 more H4 headlights, with circuit parallel and key to turn off the main headlight so as not to overload the battery, backrest and parcel holder and lights under the engine and in shape for when I go into poorly lit streets. I'm a former owner of a VL800 intruder, the differences are the C1500T weighs about 50 kg more and is slightly high, in fact it is difficult to push it backwards because the feet do not rest completely and are 1.75 tall, consumption is not so bad, it is 20km / l on the highway and 15-17 km / l on the urban road. compared to the moving VL800 is much more manageable, the double front disc absent makes itself felt in the braking, but the fact that it is to ignore means that you do not expect to heat the engine and you can start immediately, while the VL800 was supposed to wait for it to heat up, since it was a carburettor, otherwise there was the danger that the bike will be switched off and unsaddled (already happened several times). My only question if some of you eventually bought it and if it has drilled the finals of the mufflers to have a fuller sound, I still have not decided, but it is too quiet. I know that the posts date back to 2012, but I hope someone can help me in this decision, a friend of mine told me even if it has the lambda probe and holes only the final nothing happens, I still have some doubts. Last edited by Easy Rider; 04-22-2018 at 04:55 PM.